Today the show deep sixes the Ori storyline for good. We start millions of years in the past on an unknown world in the Ori galaxy where we see the people who’d become the Ancients discuss whether to fight the Ori or to flee. One Ancient brings forward a proposal to use “the Ark”, a technology that allows the forced indoctrination of people to a certain point of view programmed into it, but the others refuse. We cut forward to now as SG-1 explores the ruins of Dakara hoping to find the Ark so they can convince the Ori forces to leave their crusade but all they find is an empty chest with Ancient writing. As Vala and Daniel argue about how to open the sealed chest the Ori show up in force, forcing Daniel to agree with Vala’s brute force method of opening the crate. Fortunately for the team it’s Tomin who is leading the Ori forces, allowing them the opportunity to try and talk their way out of the situation. As the two sides talk a Prior shows up and begins speaking his usual gibberish before ordering Tomin to shoot open the chest, only finding scrolls inside, before ordering SG-1’s death. Tomin resists however and the team reveal that the Prior has no powers due to an anti-Prior device in the area. When Tomin refuses to kill them the Prior attempts to with a staff but Mitchell is able to grab one from a guard and kill the Prior first, convincing Tomin and his men that the Ori are not gods. Soon after the team return back to the SGC with Tomin in tow only to find an IOA agent, Marrick, waiting for them as the IOA want to interrogate Tomin themselves. As Marrick tries to wriggle in Tomin is already talking to Daniel and Vala about the Ark and its possible location. With his help they locate a passage in the Book of Origin that talks of the “birthplace of evil”, an obvious name the Ori would give to the Ancient homeworld. Soon after Marrick takes Tomin for his own interrogation which ends up heated as Marrick still sees Tomin as one of the enemy. In another flashback we see the creator of the Ark (and implied to also be the creator of the Stargates themselves) hide the Ark away before the Ancients take off, creating the exploding mountain that Daniel had seen in his visions now. Back in the present the SGC is planning to destroy the Supergate only for Daniel to instead press for the Odyssey to take them to the Ori galaxy to find the Ark. The mission however is surprisingly approved only for the team to find that Marrick will be coming as well to Mitchell’s annoyance. On board the Odyssey Teal’c joins Tomin in the mess while waiting to reach their destination and expresses his sympathy for Tomin’s situation, having gone through the same evils when he left the service of the Goa’uld, telling the former Ori commander that the only thing he can do now is fight for the people he wronged as his penance. Pretty soon however they make it to the Supergate and begin dialling it before soon finding themselves in the Ori galaxy. In a tavern Tomin introduces Vala and Daniel to a member of the anti-Ori resistance, Hertis, who agrees to help find the location of the Ancient village after they bring him onboard the Odyssey, proving who they say they are, but admits that the village has been searched by many groups multiple times looking for artefacts over the years. As the team prepare to visit the village Marrick tries to intervene but is rebuffed by the others. Instead Marrick on his own begins using the Asgard database for an unknown purpose. Marks onboard the ship detects activity and informs Mitchell, who has himself and Carter brought back aboard while the rest of SG-1 and Tomin continues their search. Onboard the ship it turns out that Marrick is following his own mission, using newly built Replicators to overrun the Ori galaxy. When confronted about this he’s incredibly blasé about it, forcing Mitchell to send him to the brig. The team attempt to destroy it with an ARG but it turns out the IOA have removed their ability to be destroyed by that. Back on Earth a Prior makes contact with SG-3 off-world and demands to be allowed through to the SGC, aware of the anti-Prior device. Despite the obvious stupidity of it Landry decides to allow him anyway, only to find that the Prior’s message is let Origin be taught on Earth or else. Landry however sees the demand as a last desperate act to try and stop the SGC destroying them. Soon the SGC is contacted by Ellis on the Apollo who reveals 7 Ori ships have appeared on the edge of the Solar System. Meanwhile on the Ori planet the team find a set of caves and begin to explore them for the Ark. Despite being told about the Replicator and Ori situation they can’t be extracted against their will as the Replicators have already taken control of key systems. Forced to press onwards they soon find the Ark buried amongst rubble inside a closed off cavern. Opening it nothing happens, with Daniel thinking it’s been left turned off by someone. Taking it to the surface the team find themselves surrounded, with Teal’c taking a shot to the back. Onboard the Odyssey they soon find that the new Replicators are a bit faster at the old replicating business, already swarm size and begin advancing on the ship’s crew. To make matters worse Ori ships also appear and surround the Odyssey, forcing the ship to hyperspace to buy time. Soon Marrick finds himself joined by a number of his metal friends. Outside the Asgard core room a small security team tries to buy Carter as much time as possible to find the solution to the Replicator issue. Elsewhere Mitchell finds the Replicator Queen and begins setting explosives only to be joined by Replicator-Marrick. 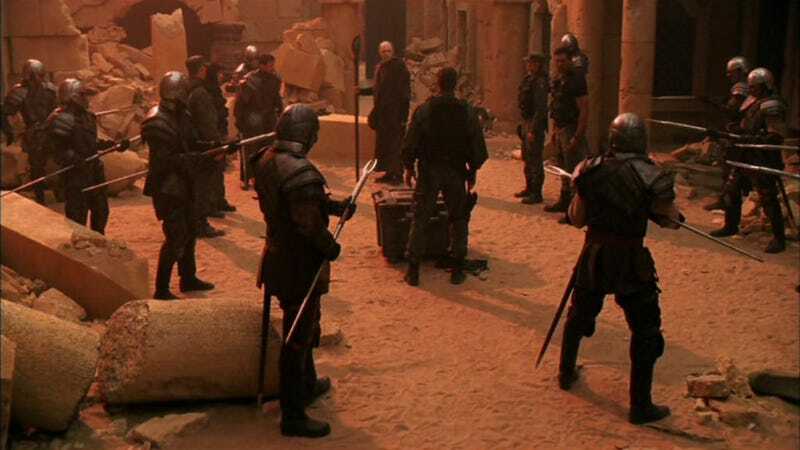 On the Ori planet Teal’c wakes up that night heavily wounded but with everyone else gone, having been captured and taken to Celestis for interrogation. With no choice but to walk alone Teal’c slowly makes his way over the mountains to reach Celestis, soon finding himself outside the city where he collapses from exhaustion. Inside however Vala is taken to the chamber where they’re holding the Ark only for an Ascended Adria to appear, who confirms that the other Ori are indeed gone meaning she now has all the power once shared amongst many. The two share a back and forth before Adria leaves Vala alone with the Ark, only for several buttons to momentarily light up on it. Back outside Teal’c’s wound is healed by an unknown ascended being. On the ship Mitchell is busy getting his arse kicked by the crap Terminator while the ship itself comes out of hyperspace when the Replicators finally take control of those systems. Soon Ori ships and begin pounding the ship with its weapons. Back in the hold Mitchell is able to temporarily remove the Replicator control of Marrick, who tells him the Replicator killswitch is simply on the reverse side of the crystal before Mitchell kills him for good, setting off the explosives in quick succession. Carter quickly removes the Replicator threat leaving just the Ori. Back in Celestis Daniel is seemingly visited by Merlin only for him to easily work out it’s Morgan Le Fay who’s been guiding them for so long. Morgan claims she can’t do much on her own and instead tells Daniel to use the Ark on a Prior as it’d destroy their network due to them being linked, thereby removing Adria’s power. At that moment however Morgan fades away as a Prior enters the hall outside the cells, only for it to be revealed as Teal’c. Elsewhere Vala breaks out Tomin and plans to free Daniel only for him and Teal’c to show up. Back in the Ark room Daniel, with Vala’s help, activates the Ark. Before they can use it however the chief Prior and Adria show up but they knock the Ark on the floor, causing the Prior to look inside and immediately reveal to himself and the other Priors the false nature of the Ori. This immediately lowers Adria’s power allowing Morgan to lock her in an eternal conflict while ending the Ori Crusade once and for all. Back at the SGC the team begin recuperating with Carter bringing Mitchell Macaroons while he’s stuck in the infirmary and Tomin heading back to the Ori galaxy to help lead his people into a brighter and less oppressive future. The Ark meanwhile is put in the custody of “top men”. An unknown amount of time later the team get ready to head out once again, finally free to simply explore the Milky Way without a big bad for once. So there we have the first of the two straight to DVD films and, well let’s be honest but it’s a bit of a mess to be honest. The film starts off fairly good but soon becomes a rather cluttered mess as it struggles to close off all the doors regarding the Ori. The baggage that the film has to deal with in the course of only 90 or so minutes really is its downfall as while with that time dealing with the Ori could’ve been manageable it instead decides to add more baggage fairly early on only to realise it has way too many plot threads to then wrap up in the end and starts to panic with so many subplots that make little to no sense. In fact the moment you can pinpoint this problem is when they decide to bring out the bloody Terminator. Robo Marrick really is the sign of the problems with this film as it clearly started to just throw stuff at the wall to make it stick. For a show that has usually been so good at avoiding going from homage/spoof to blatant ripoff it’s a shame they failed here. Instead we randomly see the return of the Replicators, because… who knows, and Teal’c gets a walking montage for absolutely no reason. For a film that was meant to be about the resolving of the Ori storyline how an enemy who hadn’t ben seen for two years suddenly coming back made no sense. While the episode does suffer from having too many things to do at least it manages to really succeed when it comes to the quality of the characters. Tomin’s attempt to come to terms with what he did and how it’s been all for naught is a standout moment on the show for a character who had way too little airtime. If it weren’t for the groundwork laid in season 10 his sudden reversal would appear strange but with that previous reluctance shown his character arc in the film is a great one for the show. Marrick’s character pre-Replicator is also interesting as we haven’t had the smug by the books pain in the arse in a longtime now and they’re always fun to see go up against the team and inevitably get their comeuppance. Despite how good the characters are in the episode one of the things that’s really off in the episode is the tone. While it’s not unusual for episodes to be serious in tone what’s really apparent here is the sheer lack of levity at any point after Vala and Daniel’s conversation at the very start of the film. Throughout the entire adventure it goes further and further down this deadly serious path, with the team being tortured by the Ori and Mitchell caught in an explosion. The film really needed some brief moments to lighten the load but never did which is a damn shame as it makes the piece instead feel way too long and a bit of a slog. Though it’s a slog the film does complete its main goal of ending the Ori threat once and for all. Over the past two seasons the show never really knew what to do with the Ori after setting them up, barely appearing in either season for most of the run as they’d clearly made them too powerful to make sense for the characters to deal with. The solution of a simple box revealing the truth to its followers was definitely the right sort of move as they had no hope of defeating the threat with a conventional arc ending move and it had the simplicity such a resolution would need before having other one-off adventures. Overall this is definitely the weaker of the two films the show put out. While it does indeed succeed at wrapping up the Ori saga it fails to stay on task, adding strange elements for no real reason, and has issues when it comes to the tone it wants to set. · Look it’s generic Ori village time again. · Marks fancies himself a joker now eh? · A walking montage? What is this, LoTR? · Christ they didn’t even keep the Terminator riff sly did they.